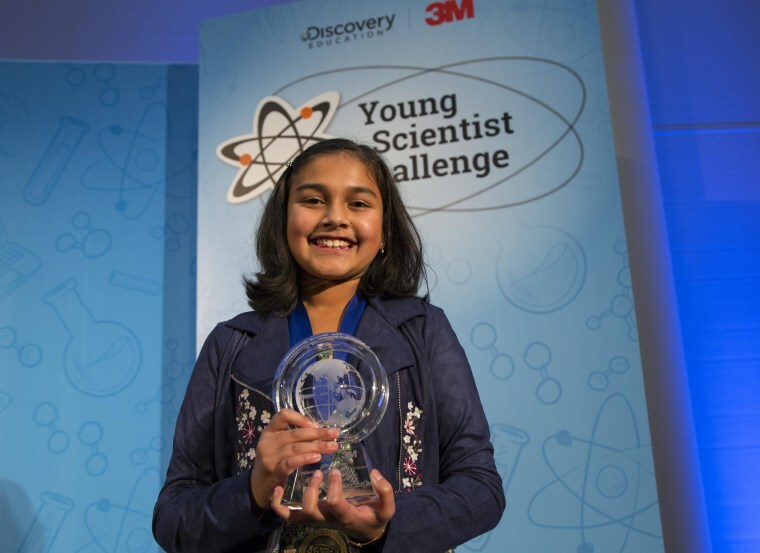 Eleven-year-old Gitanjali Rao won the 2017 Discovery Education 3M Young Scientist Challenge with a device designed to test whether water contains lead. Gitanjali Rao had already identified a “huge problem” she wanted to work on before she entered any science contests. After learning about the Flint, Michigan, water crisis two years ago, Rao, now 11, did some research. She said she found out that Flint wasn’t the only place with lead in its water and that thousands of water systems could be contaminated, affecting millions of people. “This should not be happening,” she said. Rao devised “Tethys,” a device named after the Greek goddess of fresh water. She said the device uses a replaceable cartridge that contains carbon nanotubes that can test whether a water sample contains lead. The device then communicates with a cellphone app that tells a user about the results. Rao said she has always been interested in science and like that it allows her to look at different ways to solve real-world problems. Raised in Lone Tree, a suburb of Denver, Colorado, she attends a public charter school with a focus on science, engineering and math. Rao said the staff at her school helped her by providing lab space and helping 3-D print the device. As part of the challenge, Rao was also paired with a 3M scientist as a mentor. Dr. Kathleen Shafer, a research specialist at 3M’s Corporate Research Materials Laboratory, said she “served as a sounding board” for Rao and was impressed by Rao’s passion for making a difference. “When I think of Anjali, I see a young person who is tenacious and determined as a researcher, curious about the world around her and possesses very sophisticated communication skills,” Shafer said. Rao said she plans to spend some of her $25,000 winnings on more nanotubes to develop future versions of her project. She also wants to donate some of the money to her community and save a bit into her college fund. Eventually, she hopes to attend the Massachusetts Institute of Technology and continue her studies in engineering and science. She also hopes to scale her device and make it commercially available as well as visit Flint, Michigan, to see if she can help them in their fight for clean water. “I think that science can really make a difference,” she said.